Zytronic has taken steps to further the widespread uptake of its Projected Capacitive Technology (PCT™) touch sensor portfolio, with news of its collaboration with software supplier Omnivision. As a result, the Omnitapps platform from Omnivision is now fully compatible with Zytronic’s dual touch capable range of PCT touch sensors. 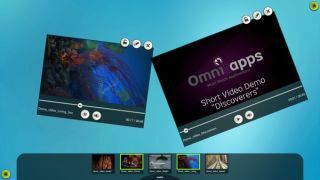 Working in conjunction with Microsoft’s Windows® 7 operating system, Omnitapps is a customizable application software package that has the capacity to support multi-touch operation on large form factor displays. It consists of an array of different professional applications that, when combined with Zytronic’s touch sensors and high-performance ZXY100 touch controllers, make it suited to user interface implementations in a variety of different sectors. These include transportation, educational, retail, public service, leisure and gaming environments. Easy to configure, this application software permits rapid upload of client content - presenting a highly flexible solution that can be customized to meet different commercial needs. Omnitapps can distinguish between intuitive gestures including slide, zoom, swipe and rotate, as well as supporting English, German, Spanish and French keyboard options. Through this platform’s multi-touch functionality, it is possible to impart valuable information to prospective customers or members of the public, as well as delivering interactive vending and advanced multi-player gaming functions. Its MediaWall function allows users to access social media sites such as Facebook and Linkedin, as well as viewing Flash-based websites, like YouTube. It also offers the provision for placing markers onto Google Maps (for adding useful information), or drawing onto displayed PDFs, videos, pictures and website content. In addition, it can show multiple websites simultaneously through a split screen feature. Zytronic’s PCT-based touch sensors consist of a matrix of micro-fine capacitive elements embedded within a laminated substrate, which can be located behind a protective overlay (more than 10 cm thick). Touch screens based on this proven technology are resistant to the various forms of mechanical damage that can potentially shorten the lifespan of resistive or surface capacitive touch solutions - such as vibration, heavy impacts, scratches, build up of dirt, extreme temperatures, exposure to potent chemicals, high humidity levels, or liquid ingress. These sensors are optimized for a wide variety of heavy use applications in industrial and public environments, where they can expect to be constantly ‘in the firing line’ of various forms of accidental and deliberate damage. Furthermore, unlike infrared (IR) and surface acoustic wave (SAW) touch sensor options, PCT can enable all glass, bezel-free designs resulting in smooth-fronted attractive user interfaces which are both stylish and practical to use.